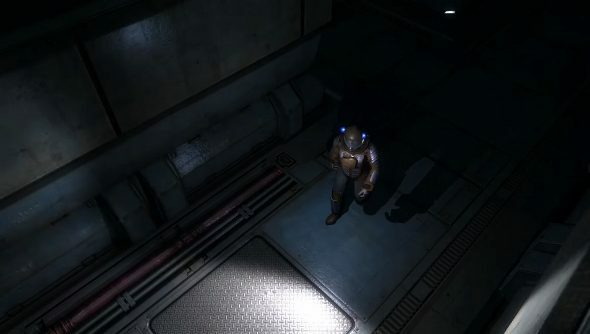 Firefly Online still isn’t ready for you to hop onboard a ship and explore the ‘verse, but developer Spark Plug Games has put together a sneak peek at the 3D environment engine. This tiny preview, first shown at New York Comic Con, shows off a procedurally generated derelict, floating in space, with Captain Mal and Jayne exploring it – though in the game you’ll have your own crew, not Serenity’s. “What you’re seeing in the video below is not a cinematic,” Spark Plug assures, though I can’t imagine anyone getting it mixed up. It’s a rather boring environment, really, but it’s just an example of one of the many random places that captains and their crews will be able to visit when they step off their ships. While it remains to be seen if Spark Plug can achieve their ambitions, the features that have been promised sure sound compelling. Crews are not just resources or typical RPG companions – they are autonomous characters that have varying degrees of loyalty to the ship they are hired to work on. They might even quit after developing a grudge against their captain. If that happens, they can be hired by another captain, who can then hunt down his or her new crewmembers ex-boss to fulfill that vendetta.